A big welcome this week to the new readers who learned of Gluten Free Philly at the recent CHOP celiac conference. I want to especially thank Alice Bast, the president and founder of the National Foundation for Celiac Awareness, for inviting me to speak alongside her about gluten-free dining and allowing me to share suggestions of kid-friendly restaurants with the audience. What food could be more kid-friendly than ice cream? This week, I wrote about Philadelphia's own Bassetts, which is celebrating its 150th anniversary this year. The company makes more than 25 gluten-free flavors available in pints and at parlors throughout the Delaware Valley. More gluten-free pizza options in the Philadelphia suburbs, all of which I'm told take precautions to avoid cross-contamination. In Pennsylvania, Boston Style Pizza's Bala Cynwyd location (298 Levering Mill Rd., 610-668-2310) now carries pizza from Still Riding, as does Caruso Brick Oven in Souderton (424 N. Main St., 215-799-1312). Caruso's also has pasta in addition to a full-fledged gluten-free menu. Reader Dana M. tipped that Johnny's Pizza in Prospect Park (547 Chester Pike, 610-461-8600) serves pizza and ravioli. Two area contemporary American restaurants note gluten-free items on their menus: Salt Creek Grille in Princeton's Forrestal Village (1 Rockingham Row, 609-419-4200) and the just-opened Gunners Run, in the Northern Liberties section of Philadelphia (1001 N. 2nd St., 215-923-4600). One of our favorite restaurants, The Pop Shop in Collingswood (729 Haddon Ave., 856-869-0111), now serves chicken tenders "breaded" with gluten-free corn flake crumbs. Be sure to ask that the dish be baked, not fried. The Phillies are off to a solid start in the first week of the 2011 campaign. In addition to hot dogs, Sweet Christine's sweets, beer and hard cider available at Citizens Bank Park (at the concession stand behind Section 128), frozen yogurt makes its debut there this season. The Yogen Früz kiosks behind Sections 127 and 315 serve gluten-free low-fat vanilla and chocolate frozen yogurt and fat-free sorbet that's blended with a choice of frozen fruit. Each serving costs $6.50. Nature's Path gluten-free cereals are on sale this month at Amazon.com. Save 10% using code NATPATH5 at checkout, and save an additional 15% with a Subscribe & Save order. 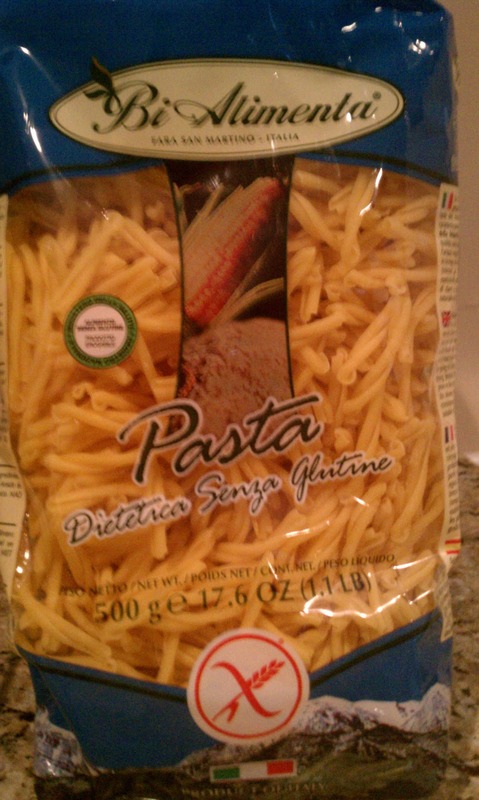 Bethann S. emailed me this photo of Italian-made Bi Alimenta corn-and-rice pasta, sold locally at Carlino's in Ardmore (2616 E. County Line Rd., 610-649-4046). My Dad's Cookies are now being sold at Martindale's Natural Market in Springfield (1172 Baltimore Pike, 610-543-6811). Thanks to Marilyn for the good word. Gluten-free Passover pizza and pizza bagels, cakes and other products are now available in supermarkets such as ShopRite and Wegmans. Look for sweets from Shabtai Gourmet, Reisman's, Oberlander and Schick's. 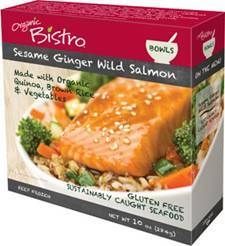 Organic Bistro is launching a new line of gluten-free single-serve bowl entrees. The new line is available in four varieties: Sesame Ginger Wild Salmon (made with sustainably caught seafood), Asian Style Coconut Lemongrass (made with organic quinoa, brown rice and vegetables), Thai Style Red Curry with Beef and Thai Style Yellow Curry with Chicken (both made with organic brown basmati rice and vegetables). Each 10 oz. package has a suggested retail price of $4.99. Members of the gluten-free community will gather in Washington, D.C. on May 4 to bake the world’s largest gluten-free cake. The "1in133" event - named for the fact that one in every 133 people in the U.S. suffers from celiac disease or gluten intolerance - is part of an effort to draw attention to the Food and Drug Administration’s delay in finalizing standards for gluten-free food labeling. You can make a donation and sign a petition advocating for the FDA to take action on determining a gluten-free food-labeling standard. The event is the idea of gluten-free author and baking expert Jules Shepard and South Jersey's own John Forberger, a gluten-free triathlete. That's all for this week. Have a great weekend! Quite excited to see the world's largest gluten-free cake!